Since day one, environmental sensitivity has been a priority at Extended Horizons. Sounds corny and unbelievable, right? Way back... in the late 1980's owner, Erik Stein, saw the potential damage to Maui's reef from boat anchors and decided to get involved and do something about it. He began working with partners from the Big Island of Hawaii and other operators on Maui, to help spearhead efforts to put permanent mooring buoys in at popular dive and snorkel sites in Maui County. As EH grew, Erik redefined the list of services offered to include Environmental Consulting when incorporating EH in the State of Hawaii in 1996. This was done with an eye on keeping the mooring program a viable part of the corporate mission so that Extended Horizons Inc. would continue to see efforts for mooring placements as integral to the company's focus. 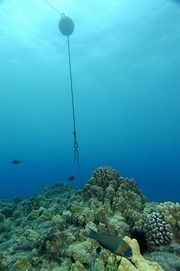 help protect Maui's reefs from anchor damage. Fast forward to Y2K... EH makes another leap toward sustainability by converting operation of our boat to 100% recycled biofuel made locally here on Maui. Just to be clear, that means our boat runs on 100% biodiesel, which is made from 100% reused vegetable oils, collected from local sources here on Maui. In fact, PADI's professional magazine, The Undersea Journal, recently highlighted EH's green efforts in an article about Going Green. 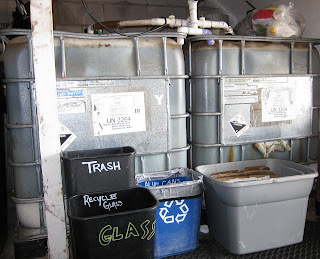 The jump to biodiesel required a few modifications to the boat, and also to the warehouse for fuel storage. And yes, it does cost a bit more than regular petroleum based diesel fuel... but the feel-good aspect outweighs the costs. Local Maui company, Pacific Biodiesel, makes our biofuel. 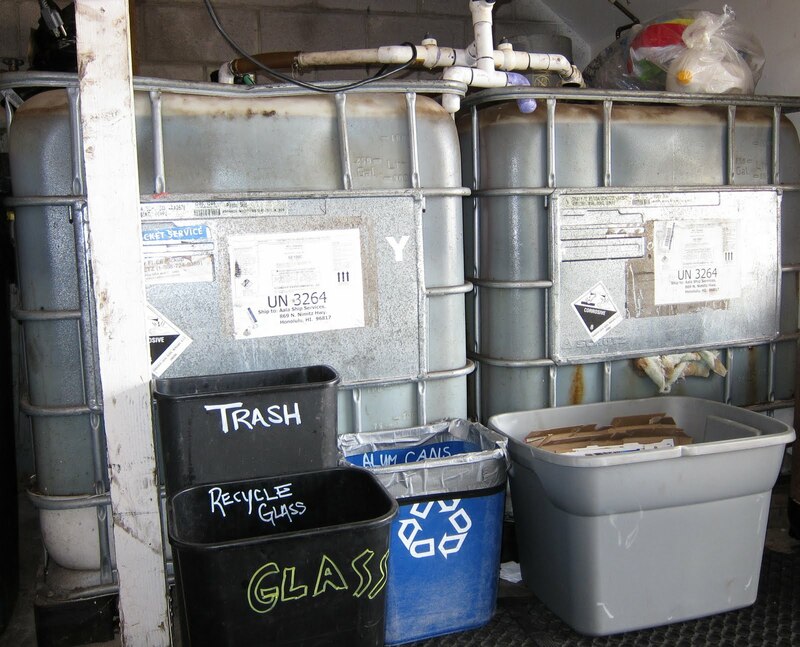 A few years after that, when bottled water became the norm around 2005, EH stopped serving beverages in paper cups as we had been doing since the 80's... EH has a recycling station in the warehouse for plastic bottles, aluminum, cardboard (and of course biodiesel!). 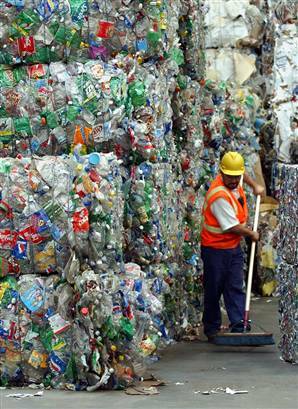 but think how much prettier to environment is because of these recycling efforts! And now here we are in 2011... after six years of recycling thousands of individual, disposable plastic bottles, we've decided it is time for a change. We recently went through another renovation at our warehouse to update our classroom space and build out the downstairs area to accommodate a dishwasher. With a sanitizing system in place, a RO system installed, and BPA Free Nalgene bottles purchased, we are now able to serve reusable bottles to our customers... putting us one step closer to zero waste operations! Even though EH recycled, it wasn't good enough. It has taken a month or so for the EH Crew to streamline an organization system for each customer to have a reusable bottle, with multiple refills throughout the day... it was definitely easier to throw away (or recycle) the single-use bottles... but we think it's worth the extra effort and we hope you do too! is one way to make your own move toward sustainability! Welcome to our DiveBlog... many of you know that Extended Horizons participates in several Eco-Friendly business practices, such as our boat running on 100% recycled vegetable oil. But we wanted to keep you informed about our other efforts locally, and globally! We thought this blog might be a fun way of keeping you informed of upcoming events, as well as fun recent sightings and encounters we've had around Maui, Lanai and Molokai. Enjoy! Extended Horizons' team consists of a small group of diver professionals, who dive for the love of diving. All of our guides are certified dive instructors and naturalists, who specialize in providing a high level of customer service. Whether you're participating in one of our scuba classes or our guided dives, you'll receive personal attention and a fun experience! Images & intellectual content Copyright © Extended Horizons Scuba 2011. Powered by Blogger.